When you have a Cadillac CTS-V Wagon, you want to do things with it. Wash it, for example. Or explain why you bought it to your Audi-driving neighbors, whose only experience with Cadillac came when they took away grandma’s keys and sold her DeVille to CarMax. But you wouldn’t want to drive it. Oh, no. That would require a) seeing out of it, which is impossible; and b) fueling it, which is a real chore, since I am convinced the entire fuel tank consists of one single repurposed 2-liter bottle of Coca-Cola. 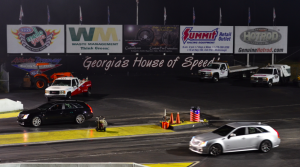 However, I recently laughed in the face of these petty challenges when I decided to take my CTS-V Wagon to the Atlanta Dragway in rural Commerce, Georgia, for the weekly “Fast Friday” amateur drag racing event. (Motto: “Beat your friends on Friday; beat your wife on Saturday!”) This, to the best of my recollection, is what happened. First of all, I should mention right away that we didn’t have just one CTS-V Wagon. 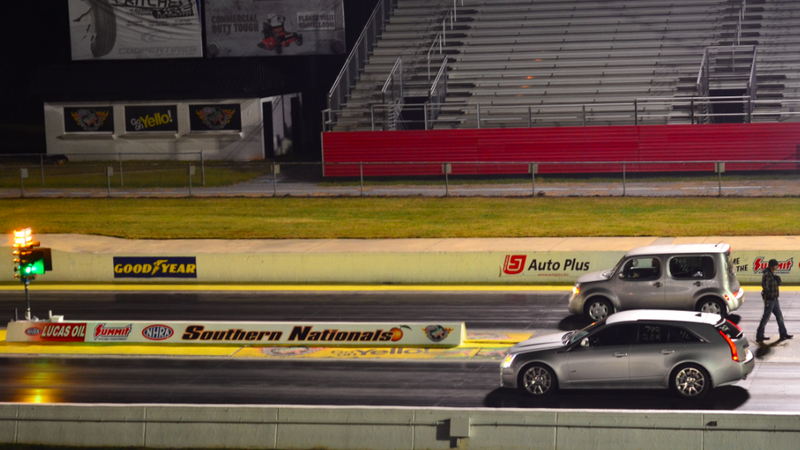 In fact, we had two CTS-V Wagons. The other was driven by my friend Dieter, who declined to let me print his full name since he also has an automatic, and he’s afraid of what you might do to him. Interestingly, a third CTS Wagon passed as we pulled out of my driveway to leave for the dragstrip, marking the largest number of CTS Wagons together in one place outside of the “Unsold Inventory” lot at GM Headquarters. Our group also consisted of a few other interesting cars. I brought my Nissan Cube, largely because I feel that vehicle’s drag racing potential is too often ignored by most traditional automotive news outlets. We also had a 2005 Toyota Corolla, a stick shift Infiniti G37S, and a Lexus CT 200h, which is a handsome little hatchback that sort of looks like a Mazda3, except with the fuel economy of a Prius and the acceleration of tree growth. In other words: we were those assholes who slowed down the guys with built Camaros that run sevens. Except, fortunately, there wasn’t really anyone to slow down. We did this only a few weeks ago, which meant it was pretty cold. (“Good for performance,” said a guy who was running a Nissan Titan that appeared to be completely stock, except for a six-inch lift.) 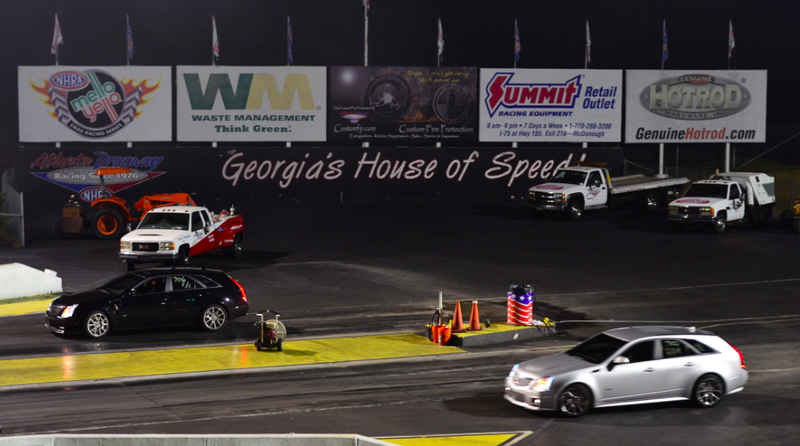 As a result, the stands were empty, the crowd was thin, and the announcer – who told me last year that I was “late for soccer practice” when I showed up with my E63 AMG wagon – was nowhere to be found. This meant we had the strip primarily to ourselves. We took full advantage of this fact by racing, over and over, in every automotive combination you can possibly think of. Cube versus Corolla? Done. V Wagon versus V Wagon? Of course. G37S versus lifted 1970s Chevy pickup flying the rebel flag? Obviously. CT 200h versus newly-planted sapling in the parking lot? Do you even have to ask? We did this for hours and hours. 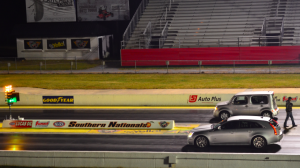 I only drove three or four times, but the whole experience gave me some insight into the drag racing community; insight that I will now share with you, a typical car enthusiast who has not yet visited the dragstrip because when your wife hears “drag racing,” she thinks about Chip Foose driving one of those Top Fuel cars that shoots fire. And that insight is: bring an automatic. That’s right! You guys have made fun of me for weeks, months even, for getting an automatic V Wagon. 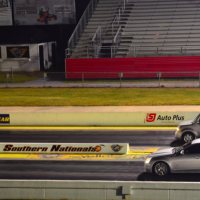 But it turns out that automatic is actually better for the dragstrip. While a stick shift guy has to sit there and think about the clutch, and the gear lever, and the RPMs, and the launch, all I have to do is throw my car in “Sport,” push the pedal, and collect my time slip at the end. An idiot could do this, a fact of which I’m certain, because I personally did it several times. So automatic is definitely the way to go. 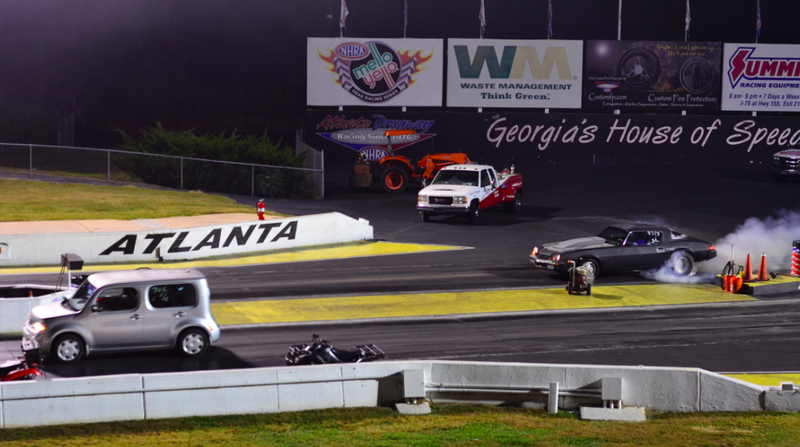 Never mind that 99.9994 percent of my driving isn’t on the dragstrip: I now feel vindicated. Speaking of automatics, I know you’re all wondering what it’s like to drag race a Nissan Cube, so here’s a general overview. First, you line up at the lights with an almost incredible sense of self-consciousness; the same sense you might get if you were a black teenager and you just walked in to Barney’s. This stems from the fact that you know every single person in the stands is wondering why the hell some dern cityfolk brawt out one of dem Korean box cars. Also, you know they have guns. Next, you summon your inner-NHRA competitor. You press the gas and brake at the same time; you intently watch the lights; they turn GREEN! ; you release the brake; your tires chirp… and you roll away at the same velocity as a funeral procession. The whole thing actually ends up being very pleasant, and you really get to know the dragstrip, since you see it go by so slowly. Also, you are constantly worried the Cube might simply explode, since the tires are flat-spotted and the oil hasn’t been changed since 2011. Anyway: in the end, Dieter’s best time was just a hair over 12 seconds – 12.06, if I remember correctly. My car was good for 12.6 seconds with me in the driver’s seat, though my friend Mark managed to get it down to 12.5. The times, though, weren’t as important as the sheer enjoyment of lining up at the lights, pushing the pedal down, hearing the V’s supercharger whine and its V8 roar to life, listening to it go through the gears, and then, at the very end, looking in the mirror and reminding myself that I’m sitting in a station wagon. The Cube’s best run, meanwhile, was just a hair over 17 seconds. We repeatedly tried to break into the 16s, but eventually the self-consciousness got to us and we gave up. Maybe next time we’ll come back with rebel flags. Rebel flags… and an oil change. This article originally appeared on Jalopnik. So what was the results from the Corolla and the CT? I know I’m one of VERY few readers that actually gives a damn but I’m curious. You probably could’ve gotten the Cube to run in the 16s if you had a couple guys run behind it and push. I think you meant “…one single repurposed 2-liter Coca-Cola bottle,” but (hilarious) point taken.